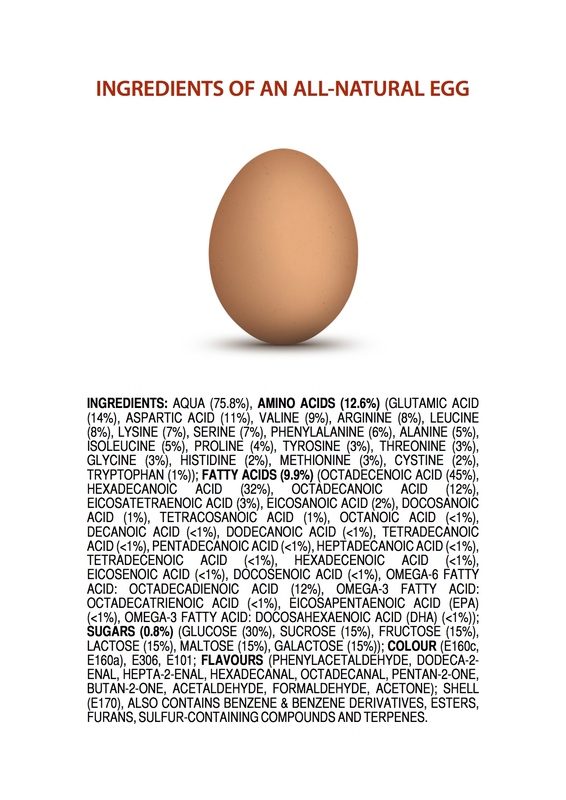 This is the last of three posters in the “ingredients” series. I think I’ve made my point. I’ve exhausted it, in fact. Enjoy. (3β)-cholest-5-en-3-ol would be an interesting addition to the list. There are probably thousands of organic compounds in an egg and I wanted these designs to fit onto A4 paper, so I had to choose just a few major ingredients from high-resolution GC/MS results I found in academic journals. James, I attended a small college in SoCal for my undergraduate degree and then went to a Ivy League school for my PhD. I popped back in here to let you know that my husband showed me your posters yesterday on his Facebook feed. I do believe this means you’ve gone viral! Thanks – that’s nice to know! These graphics are fantastic! I would love to post them in my non-commercial blog: sleuth4health.wordpress.com. Please write sleuth4health@gmail.com if you offer permission. Thanks. WELL DONE! Thanks! That’s because of rounding. In future posters (passionfruit onwards), I adjusted the figures to acc up to 100% even when rounded. Hope this helps. This is not an exhaustive ingredients list. However, lecithin probably deserves to be included because it was named after ‘egg yolks’. Thanks! Really puzzled about what your point actually is. The information (ignoring the dodgy addition – ’rounding error’? So large from so few roundings – I think not!) seems to aim to hide the nutritional value or otherwise of an egg and to create an association in the undiscerning reader’s mind between chemical representations and “nothing to worry about as every food can be viewed in terms of its chemistry”. This is so blatantly manipulative and unscientific in its goal of obfuscation that your motive and scientific clarity are brought into question. Yes, I agree with you. What’s is the point? I think it’s more of a hidden agenda? A poster for Isagenix?!!! An egg contains Formaldehyde? These are amazing! I found this shared on FB, can I use it to share with friends? Thank you! Although those are all constitutes of eggs the ingredient list for eggs is still just egg. if you really thought otherwise you would have made this a comprehensive list because your reductive list of ingredients for egg is only is only different than “Egg” in the scale of your reductivity. Kinda pointless. If I want to pick up all these ingredient, where can I get them? Try alibaba.com or ebay.com. Many of these ingredients are safe enough to purchase without a licence. For a project – Where can I purchase the ingredients listed for the all natural Egg? Do you or anyone know of companies/sources that will mix the ingredients per the amounts identified? You want to make artificial egg? What is the category these items will come under, organic compounds, food ingredients, or something else? How come the egg contains lactose? I tried to find a source for this information but failed to do so. On your poster it says Cystine (in the amino acids section) did you mean cysteine? Excellent! It brings to mind those artificial raw eggs the Chinese are making and selling to the unwitting public – I’d love to know what’s in those! Each egg is different, and that USDA list is nowhere near as specific as the posters shown here. Sadly though, some people are totally misunderstanding the message – they are assuming that eggs are “poisonous” and need to be avoided at all costs, as well as using the information to back up their claim that only the vegan way is healthy and good and etc. So you might say that in some (possibly many) cases the poster defeats the purpose.